In many fields of industry you don't always have the luxury of working with perfectly smooth, flat surfaces that provide your label with maximum adhesive contact. Often the surfaces you are labelling are textured, rough or uneven, which means that your label is only adhering to “points” of the surface. So the actual adhesive strength of labels that work well on smooth surfaces is greatly reduced, sometimes by as much as half. To compensate for this effect, our Strong Adhesive tapes are made with a more pliable adhesive that instantly fills recessed surfaces, making more surface area contact than our standard tapes. This is the secret of how our Strong Adhesive tapes can provide up to twice the adhesive strength for those difficult to stick to surfaces. 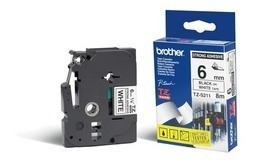 Abrasion Resistant P-touch TZ Labels - Brother's patented tape technology ensures that Brother P-touch laminated labels can withstand even heavy abrasion. Temperature Resistant P-touch TZ Labels - Whether you want to use our labels in freezing conditions or extremely warm environments, Brother P-touch laminated labels have been designed to last. We know this because we have tested them to the extreme. In fact, results show that our laminated labels can withstand temperatures from -80°C to 150°C. Fade Resistant P-touch TZ Labels - Wherever you use P-touch laminated labels, they will stay as clear and legible as the day they were applied.